Savvy Mode: Lux or Savvy? Besides, home decor and tabletop, Baccarat is trying to make a name for itself in recent years with debut of its jewelry collection. SG really likes the organic feel of Galet collection; the design reminds me of flowing water. I was quite sad when I broke my red Galet ring. I accidentally slam my palm against the table and the rest is history. Fortunately, Baccarat offers 50% discount on a replacement ring after I turned in my old broke one. It's said, to create Baccarat red, gold element is required for the color to appear so. 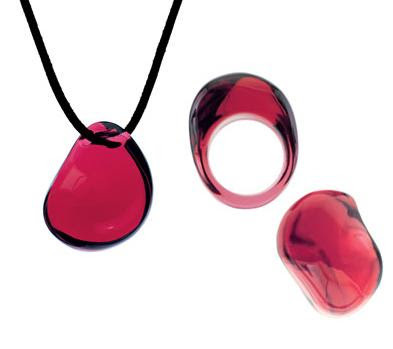 Baccarat Galet pendant and ring are classics, available in variety of colors. Price is $230 for pendant and $275 for ring. A newer design, Baccarat Scarabee pendant in iridescent, a Baccarat patented technoloty, is very stylish and eye catching, price about $550. With the state of economy, SG won't be a savvy gal if I don't even attempt at finding comparable goods. 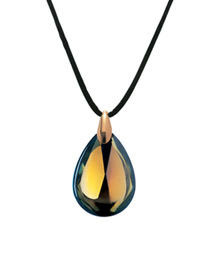 Swarovski Galet pendants (available in 2 sizes) are quite savvy and stylish, just like Baccarat. Price is $80 for large and $42 for small pendant. So which version do you prefer, savvy or lux? Those are gorgeous! I love the top pink necklace. No question about it for me on this one I would save up for the Baccarat Red. I like the red ring. Baccarat Galet pendant & ring is a very sweet & fresh style! But I can’t resist the charm of this Baccarat Scarabee pendant in iridescent!